Recently the Digital Library completed a digitalization project of the “Robert M. O’Reilly” papers. The collection’s subject, Dr. Robert O’Reilly, was a Philadelphia native, who held a medical degree from the University of Pennsylvania, and had a lengthy and distinguishable career in the U. S. Army which lasted over 40 years, from 1867-1909. The O’Reilly collection consists of over 300+ items, chronicling Dr. O’Reilly’s personal life and military career, includes his personal letters, a selection of published U.S. Army General Orders, from the United States Adjutant-General’s Office, in 1870, and his scrapbook from the 1906 International Conference for the Revision of the Geneva Convention where he was a delegate for the United States. There are several unique certificates, in this collection, given to O’Reilly signifying his succession in military rank; the certificates are sizable and elaborate in design and signed and countersigned by the President and Secretary of War. 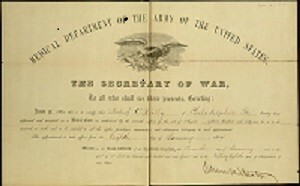 Edwin M. Stanton, Secretary of War under Lincoln and Johnson, signed O’Reilly’s first certificate, with his appointment as a Medical Cadet, in January, 1864. 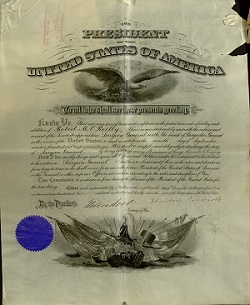 Several certificates display the signatures of Presidents Cleveland and Theodore Roosevelt authorizing O’Reilly’s promotion in rank; in most cases the certificate had a stamped Presidential signature, and were countersigned by the Secretary of War as well as recorded in the Adjutant General’s Office. The Collection is owned by the American Catholic Historical Society and held at the Philadelphia Archdiocesan Historical Research Center in Wynnewood, PA. Be certain to check out the Center’s blog, by Amanda McKnight, entitled, “Robert M. O’Reilly, Surgeon General” which provides a summary of Robert O’Reilly’s life and career. If you are interested in more information on the role of a Medical Cadet during the Civil War, 1861-1865, I suggest reading this blog: Schmidt, Jim. “Medical Department #36 – Medical Cadets.” Civil War Medicine (and Writing): A blog on Civil War-era medicine and my own historical research and writing. 11 October 2010. Accessed 13 July 2015. Printed. Military Commission Certificate, To: Robert O’Reilly, Assistant Surgeon, U. S. Army Signed: Andrew Johnson, President of the United States and Edwin M. Stanton, Secretary of War, July 24, 1867. Printed. Military Promotion of Rank Certificate, To: Brigadier General Robert O’Reilly, Surgeon General, U. S. Army Signed: Theodore Roosevelt, President of the United States and Elihu Root, Secretary of War, December 2, 1902. I have one for a Navy LT promotion Signed by Pres Taft in 1911. Mine is rolled and in great condition. What would you value something like this? I’m not sure what to do with it.